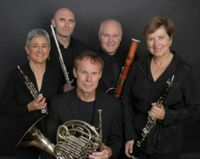 The Borealis Wind Quintet, nominated for a 2006 Grammy Award in the Chamber Music Category, is acclaimed as one of America's preeminent chamber ensembles. The highest musical integrity, irresistible energy and five-fold charisma distinguish Borealis in the chamber music field. Audiences love their exquisite programming that includes the finest of the classics, engaging commissioned works, opera arias and works for piano and winds. The Washington Post praised their "sensitive collaborations that have a sophisticated and cosmopolitan air." Peter G. Davies of the New York Times described one concert as "a polished, elegantly turned performance...each work received lively, expert and musicianly treatment by this skilled and exceptionally talented chamber group." Joseph Horowitz, also of the New York Times describes "lively communicative readings...the performance was a scintillating one." The Philadelphia Inquirer writes, "They demonstrated the sort of rapport that characterizes the very best chamber playing." Keith Bonner, flutist, has performed in a wide variety of ensembles, including symphony and opera orchestras, Broadway pits, movies and television. Mr. Bonner is currently principal flute of the Riverside Symphony, and will be performing the Nielsen Flute Concerto with them this spring at Lincoln Center, NYC. He has performed with the Symphony orchestras of New Jersey and Stamford, CT as well as the Orchestra of St. Luke’s, New York City Ballet, American Symphony Orchestra and the New York Symphonic Ensemble. Mr. Bonner can be heard in the orchestra of the 25th anniversary production of Les Miserables now on Broadway. He is on the faculty of Brooklyn College and Special Music School in New York City. He has degrees from the Manhattan School and the Cleveland Institute of Music. Tamar Beach Wells is principal oboist with the Greater Bridgeport Symphony and has played with the Hartford Symphony Orchestra, the American Composers Orchestra, the Berkshire Bach Ensemble and the Westchester Symphony. Ms. Wells has been a member of the Springfield Symphony and the Goodspeed Opera, and has toured nationally with Andrea Bocelli. In addition to the oboe, she plays the English horn, oboe d’amore and bass oboe and frequently collaborates with vocalists, choruses and other artists in diverse settings ranging from traditional solo performances to recording sessions, pop to opera. She has also given hundreds of childrens’ concerts with the Hartford Symphony’s inner city outreach program. Ms. Wells has been on the faculty of the Hartt School and the University of Connecticut. She is a voting member of the Grammy Foundation. Ms. Wells holds Bachelor’s degrees in performance and education from the Hartt School and a Masters degree from the Juilliard School. Kathryn Taylor, clarinet, has performed across the US as a chamber and orchestra musician as well as a soloist. A resident of Connecticut, she is principal clarinetist of the Greater Bridgeport Symphony. She performs with the Stamford, New Haven and Hartford Symphonies. Ms. Taylor has performed in several festivals including the Aspen Music Festival in Colorado, the Spoleto Festival in Charleston, SC, the Windham Festival in New York and the Newport Festival in Rhode Island. She has toured Europe as principal clarinetist with the American Symphonietta and performed in the orchestra of Beauty and the Beast on Broadway. Ms. Taylor attended the Juilliard School where she studied with the legendary Leon Russianoff. Dan Culpepper is a very active freelance horn player in New York City. He performs with the New York City Ballet, New York Pops, Little Orchestra Society, Pitstop Players and at Radio City Music Hall. Mr. Culpepper's career has been both diverse and eclectic. He has performed or recorded with Frank Sinatra, Barbara Streisand, Elton John, James Taylor, Beyoncé, Pavarotti, Sting and Yo-Yo Ma among others. He has recorded numerous film soundtracks, TV and radio commercials and live broadcasts. On Broadway Mr. Culpepper has been a member of the orchestras of Les Miserables, Miss Saigon and is currently principal horn of Phantom of the Opera. Wayne Hileman, bassoon, has performed with many orchestras including the New Haven, Stamford, American and Westchester Symphonies, and appeared as a chamber player, soloist, or as continuo at many venues, including the Pro-Arte, Windham, Alliance Artist, and New England Bach Festivals. In addition, he is an audio engineer, restoring historic recordings for major labels, producing live concerts for NPR, editing and mastering new releases for many classical artists, and is a voting member of the Recording Academy (the Grammys). In 2006 he co-founded Candlewood Digital, a high-end recording company dedicated to the needs of classical musicians. Mr. Hileman holds degrees from Potsdam College and Yale University.